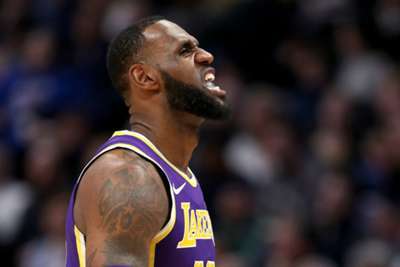 The Los Angeles Lakers are in fifth place in the Western Conference and they handled the Memphis Grizzlies with ease on on Saturday. Los Angeles beat Memphis 111-88, and they did most of their work in the first half. By the time the first two quarters were up, the Lakers had secured a 23-point lead. They scored with ease and coasted against the Grizzlies. This victory marked the Lakers' fifth win in their last six games. LeBron James is already breaking records in Los Angeles. He entered Saturday with the most points by any Laker through their first 25 games wearing the purple and gold. He had notched 717 points before tipoff, and he flirted with a triple-double against the Grizzlies. James had 20 points, nine assists and eight rebounds. Kyle Kuzma matched James' game high with 20 points of his own. Wayne Selden was the surprise top scorer for Memphis. Selden scored 17 points on seven-of-12 shooting. Cavaliers rookie Collin Sexton had a career-high 29 points, 10 rebounds and six assists in a huge 116-101 win over the Wizards. James Harden scored 35 points on 11-of-22 shooting in the Rockets' 107-104 loss to the Mavericks. John Collins had 30 points and 12 rebounds in the Hawks' 106-98 victory over the Nuggets. Trey Lyles got to start for the Nuggets in place of Paul Millsap, who is out with a broken toe. Lyles logged 38 minutes, but scored nine points on two-of-13 shooting in a 106-98 loss to the Hawks. Lyles only made one of his seven three-point attempts. John Wall had what is easily the worst game of his NBA career against the Cavaliers. Wall scored one point on 0-for-five shooting. Bam Adebayo rose above Montrezl Harrell in the Heat's 121-98 pounding of the Clippers. Damian Lillard showcased why he has been one of the NBA's most clutch players in recent years as he knocks down a three-point dagger to lift his Trail Blazers above the Timberwolves 113-105. Portland's backcourt comes in clutch! These are the top two teams in the Eastern Conference, and this matchup should prove to be much more exciting than their last one. The last time these two squads met, both sides were undefeated, sporting 6-0 records. Milwaukee claimed a 124-109 victory over Toronto, but Kawhi Leonard and Giannis Antetokounmpo did not play in the contest. Now both sides will be at full strength, so it should be an exciting display featuring two of the NBA's top talents.